A couple of my friends thought I was a wee bit bonkers to suggest that going on an underground ghost tour was a good date option in Edinburgh. But let’s think about this for a second: you’re more likely to get away with pinching someone attractive on the bottom in the dark, and it’ll be full of great opportunities to hold someone’s hand tight in fright. Just me? No, didn’t think so. 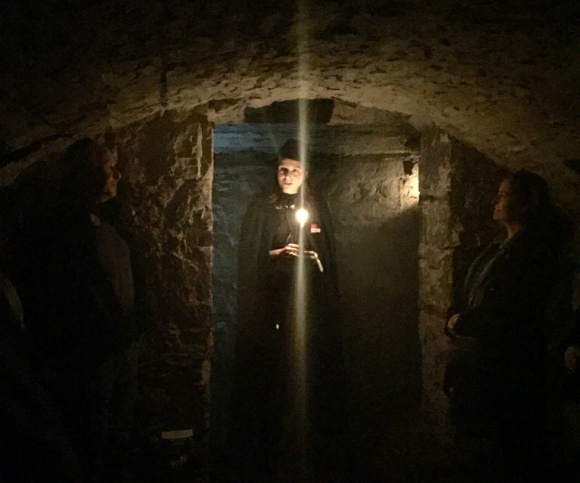 Mercat Tours offers a great selection of outings for those who want to explore Edinburgh and learn about some of the spookier and more disturbing parts of its history. The city is known as the most haunted in all of Europe, and its apparent paranormal activity and ghost sightings are an unavoidable talking point while wandering its streets. As you walk around the city centre, on every corner you’ll see a tour guide in ghostly fancy dress leading a group of curious visitors through alleyways and cobbled streets, telling tales as they go. I wanted to investigate what it was all about and hopefully meet some like-minded people. Our tour of around 12 people met at the Mercat Cross. This is a location that in days gone past was a gathering point for crowds eager to hear important announcements – but of course, it wasn’t just used for that. It was also a place of tortuous punishment and death for those who had committed crimes against the crown. So began the gory and terrifying tales, which led us on our way to the vaults. The South Bridge in Edinburgh was built in the late 1700s and is made up of 19 stone archways, under which lie the vaults. These underground chambers were supposed to be used as storerooms for the respectable shops, such as bookbinders and goldsmiths, that were located along the bridge itself. Once these shops eventually moved elsewhere, other, less reputable business owners took them over, and the vaults were used for illegal activities. The vaults were also used to shelter the poor, who couldn’t afford to live in the houses above, but along with that, they also became a haven for criminals of every horrific variety. The murderous grave-robbers Burke and Hare were said to have used them to hide their prey. Along the way, I heard tales of ghouls, ghosts, criminals and crooks, all told by a spooky-looking tour guide caped in black who led us through the vaults by candlelight. Each tale was told dramatically and captivatingly, and left you wanting to know more. The tour is a great way to learn about the history behind the place in more depth and to hear the stories of some of the people who would have resided there (or still do, if you believe in that sort of thing). So, whether you find yourself on the “Evening of Ghosts and Ghouls” or “Hidden and Haunted” tour, I’m sure you’ll have a chilling and wonderful experience. I’d say this is a really fun suggestion if you’re taking a trip to the wonderfully historic city of Edinburgh with anyone who’s interested in the darker side of its story. There’s a lot of laughing and plenty of opportunities to grab someone’s arm and huddle up tight under the candlelight – though you may need a stiff drink afterwards. To find out more, visit www.mercattours.com/ghost-tours.asp. Follow Lisa Coleman on Twitter at @Lisa_D_Coleman.